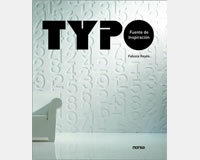 'TYPO: The Beautiful World of Fonts' is not a conventional book on typography. Its intention is to reach beyond usual typographical use by presenting a selection of projects originating in various creative fields including graphic design, fashion, sculpture, industrial design and architecture. Artists and designers from around the world were invited to contribute works to this in-depth exploration of typography. Many of the projects included in this book challenge the barriers of typographic design and propose original solutions and alternatives, interacting with the viewer to cause in them reactions, sensations and feelings. Stefan Sagmeister, Andrew Byrom, Olga Advanced, Catherine Griffiths, Michael Goodward, Borgia Garmendia, Silvia B., Why Not Associates, Gordon Young, David Dolphin and Pentagram are just some of those who were invited to submit works for inclusion in this publication. A must for students, artists and practising designers alike!